How to make Summer Foods menu for restaurants. Summer times in the US, when the mercury shoots up to 35 degrees centigrade and beyond,have encouraged many Americans to make adjustments to their food menu, for health and wellness. During this season, both adults and children seek to consume foods that will keep them energetic and healthy. Summer time is actually family time. The dietitians offer advice with lots of great ideas for family cookouts, summer recipes and grilling fruits and vegetables. The kids too wish to enjoy their summer vacations with ice creams, desserts and all sorts of junk food while sitting in front of the Tv. The best and healthiest summer foods for kids are drinks, juices, fruit cups, yogurt wraps, burgers, pancakes, eggs, popcorn and watermelons/ musk melons. For most adults however, the odds are high that families will be grilling up hamburgers and hot dogs, washing it down with a tall glassof iced tea. Fried chicken and fish tacos will be favourites too. When it comes to nutrition and health the following fruits and vegetables are a must in one's diet program this summer: Sprouts, Watermelons, Cucumbers, Berries, Tomatoes, Rhubarb, Citrus fruits and Bananas. Most of these contain Vitamins and minerals essential for health and wellness such as, Vitamin A, C, B6, B12, Mangenese, Potassium, Magnesium, and Phosphorous. Further, these keep the body hydrated and the digestive system smooth during the summer months. The biggest challenge which the restaurateur faces during summer months is to sustain profitability and maintain a fiscal balance in the midst of all the discounts, combos', special deals and add-ons which he has to advertise and provide in order to entice new customers and retain loyal ones. While this cost-revenue dynamics envelopes all categories of restaurants ( Quick Service, Full Service and Catering / Take-away ), restaurateurs also take this opportunity to achieve abstract benefits like branding ,positioning and product differentiating from which the business would stand to gain for the rest of the year. Plan well in advance. If your specialities are in pork and beef, plan for discounts on combinations to delight and retain customers. Or change over to Chicken & Fish, which customers prefer in summer. Coordinate with your vendors/suppliers regularly. Check your stocks and inventory. Ensure good quality offers on each item. Hire or train chefs to prepare the menu. Keep a lean menu,with 10/12 items, with soft drinks and beer. As the drinks will be in heavy demand, you may mark-up the drinks' prices to maximize margins. Design a picture frame digital menu board for maximum visual impact. 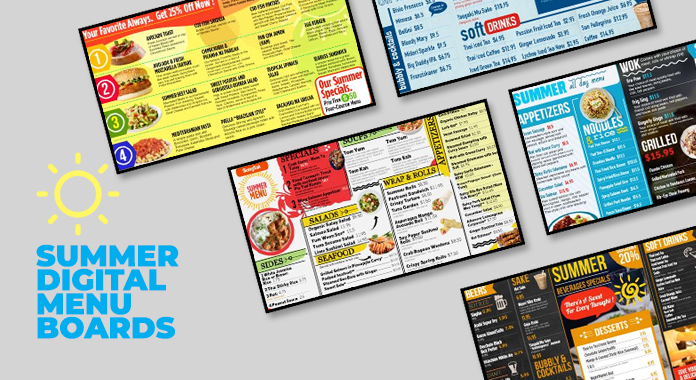 Attractive colors and graphics can also adorn the menu board. Highlight each item appropriately. As Sides and Add-ons, offer nutritious fruits & vegetables along with the meat and fish dishes. Examples could be Watermeloms, Sprouts, Tomatoes, Bananas, Citrus fruits. Offer options to the customers for preparing their own fruit salad or veggies salad. In summer, most customers will be willing to pay a premium to keep cool in mind and body ! Pricing the menu is crucial for your success. Hence, it is imperative for all offers, discounts, combos', add-on and DIYs, to have a competitive pricing prepared in advance with the cost-revenue analysis done in. Your digital menu board will be your best POS advertising. Add a catchy caption or a one-liner on the menu board to entice and allure the target audience. Slogans like 'Best Summer Delights Come With a Less Price' could help feed the curiosity of any passerby (a potential customer).